At the time of the 1988 carbon 14 tests, when an Oxford researcher commented that anyone who now believed that the Shroud was real must be a member of the Flat Earth Society, there really was a Flat Earth Society. The Flat Earth Society was, and still is, a worldwide organization with a few hundred members, headquartered in Lancaster, California. The worldview of its members is rooted in the tenets of the Universal Zetetic Society, which flourished in England in the 19th century. Charles K. Johnson, its president in 1988, had, as he saw it, “reduce[d] truth to factuality, either scientifically verifiable or historically reliable . . .” His history was right out of the King James Bible and from a collection of highly imaginative conspiracy theories, mostly in his head. “It’s the Church of England that’s taught that the world is a ball,” proclaimed Johnson. “George Washington, on the other hand, was a flat-earther. He broke with England to get away from those superstitions.” What is true, at least, is that in the late nineteenth century, a Yorkshire Church of England vicar, the Rev. M. R. Bresher, was so horrified by the Zetetic movement that he went about England strenuously arguing that the world was certainly round, like a ball. Johnson and his wife Marjory wanted to scientifically verify the claims of Samuel Birley Rowbotham, a founder of the Zetetic movement who wrote Zetetic Astronomy: Earth Not a Globe. To do so, they carefully examined the surfaces of Lake Tahoe and saw no curvature. This satisfied them that Rowbotham’s scientific conclusions were correct and that the world was indeed flat. Most of us – I hope most of us – know better. It doesn’t take much knowledge of science and history to know that the world isn’t flat. We might say that our own worldviews are better tuned to reality than those of the flat earthers. But, how much better do we know the truth? There are some of us who believe that Columbus discovered America and demonstrated that the world was round. Perhaps, if we believe this; if this is part of our worldview, we are not as well educated about history as we should be – or perhaps we are victims of a bad education or cultural influences. If we believe this about Columbus, if we believe that he discovered America and proved that the earth was round, it is also unlikely that we know that we have learned the wrong things. It has become part of our worldview. And unless we run into contradictions and are open to investigating them, we continue to believe it. And, it affects other things which we may believe. Boorstin: A Europe-wide phenomenon of scholarly amnesia . . . afflicted the continent from AD 300 to at least 1300. During those centuries Christian faith and dogma suppressed the useful image of the world that had been so slowly, so painfully, and so scrupulously drawn by ancient geographers. Manchester: During the long medieval night, Hellenic and Egyptian learning was preserved by Muslim scholars in the Middle East, where it was discovered by early Renaissance humanists. But this, too, is erroneous. Such wrongheaded thinking started with Antoine-Jean Letronne, an academic with strong anti-religious prejudices, a member of the Institut de France, the French Academy. In his 1834 work, On the Cosmographical Ideas of the Church Fathers, he clearly misrepresented the church fathers and their medieval successors as believing in a flat earth. Washington Irving, at about the same time, wrote the amazingly popular The Life and Voyages of Christopher Columbus. In it he convincingly tells the story of Columbus explaining to the incredulous Council of Salamanca that the world is not flat. Historians have bought into this and even today propagate the myth. While it may be true that a segment of the population believed the world was flat, it was not because of Christian thought and dogma but because of simple folklore, much of it pagan. Few who thought the world was flat ever read Topographia Christiana, the absurd biblically-based description of the world by Cosmos, a sixth-century monk. Those educated enough to read his works, did not take him seriously. Arguably, much of the population just didn’t think about the shape of the world at all – it wasn’t important to most people who lived in small communities and never ventured more than a few miles from home. Those that did think about the shape of the earth were educated and actually understood that the world was round. Clement, Origen, Ambrose and feet-opposite-ours Augustine all thought that the world was round. Thomas Aquinas when he wrote Summa Theologica spoke of a globe at the center of a universe encircled by transparent spheres holding the heavenly bodies. Aquinas was much into angels – his worldview – and so he thought that angels moved the heavenly bodies about the earth. Isidore of Seville, once a custodian of the Sudarium and one of the most gifted, influential and best read writers of medieval Europe, expounded on the ancient view of a round world. His compendiums of classical learning were read throughout medieval Europe for many centuries. Dante wrote of “our hemisphere” in The Inferno. The Venerable Bede described the earth as round “like a playground ball.” Roger Bacon, we know, also knew that the world was round. We can be confident that the world was well understood to be round in the medieval court of King Ferdinand II and Queen Isabella of Spain. It was a well-known fact throughout all of Christendom. Malformed perspectives and misunderstood history shape our worldviews. It makes dark ages of the Middle Ages. It helps sustain a feeling about an era when theologians debated how many angels could dance on the head of a pin. It is unlikely that they did so. This false idea seems to have originated with Isaac D’Israeli (1766-1848), the father of the great Prime Minister Benjamin D’Israeli. Isaac took great pleasure in lampooning the philosophy of Thomas Aquinas. Aquinas had wondered if an angel, in moving from one place to another, passes through the area in between. He also wondered if several angels could be in the same place at once. The myth of the dancing-on-a-pin question, it seems, was nothing more than D’Israeli’s comical restatement of Aquinas’ ruminations. Malformed history also fuels a picture of an age of naiveté in which it is easy to suppose that anyone in the medieval era could be duped into believing anything, so long as the Church fostered false information. It is easy to suppose – believe – imagine – that anyone could be duped into thinking relics were real when they were not. It translates to our modern worldview that we should be suspicious of all relics that had an historical footprint in medieval times. How right are we in being suspicious? I suspect that much of the reason we don’t accept the possibility that the Shroud is real is because of its footprint in medieval Europe. Just as some posit that Jesus was not buried because men like him who were crucified were usually not buried, even left on their crosses to be devoured by dogs, we can reconstruct a history of the Shroud from likely plausibility. Should we not, however, try to stretch the envelope of our worldview, just as Aquinas did when he wondered if angels can go from one point to another without going through the in between? 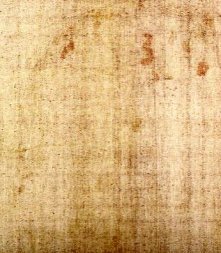 Should we not wonder that, if the Shroud is really 2000 years old and that it is now in Turin, that it had to pass through the in between, which was medieval Europe. History that is far more credible than much of the history understood about Columbus seems to bear this out. If that is so, then Constantinople from 944 to 1204 was between Edessa and Europe. Perhaps Edessa was in between Jerusalem and Constantinople. Unless we know that our worldview of history is absolutely correct, we should not let it rule what we will consider. And the same must be said for science, particularly science used by history. Most of us, when hearing that something has been dated by some scientific method assume that the results are definitive. It is the gospel truth. It is science, after all.